This extremely interesting film shows a shipment of coal making its way on the Regent’s Canal through various locks from east of central London through the city to the rural areas north of London. The film states that the canal was then 100 years old, indicating a construction date of 1824. This entry was posted in Uncategorized on December 27, 2014 by Florida's Big Dig. This seven-mile long canal connects the Indian River (Lagoon) to the Mosquito Lagoon. In 1852, the first chief of the Army Corps of Engineers, Lt. Horatio Governeur Wright, supervised the construction of a plank board-lined 10 foot wide by 2 feet deep waterway after Congress grudgingly approved the expenditure following decades of debates over Congress’s power to expend federal funds for inland waterway construction in the absence of express Constitutional authority. Here, in this instance, the federal government’s obligation to provide for the “common defense” gave Congress implied authority to build canals and inland waterways. One hundred years later, this argument would support President Eisenhower’s initiative to build a nationwide Interstate Highway system. The Haulover would be the first constructed link in Florida’s part in the Atlantic Intracoastal Waterway. The name “Haulover” was given the short link as a result of three Seminole Wars during which the military removed men and materials from barges transporting men and materials from either the end of the Indian River or the Mosquito Lagoon and “hauled over” a seven-mile spit of land to the other body of water. In the 1950’s, the federal government modernized this short link, cutting through hard, sharp coquina rock at considerable cost. This entry was posted in Uncategorized on December 24, 2014 by Florida's Big Dig. The Bridge of Lions over the Intracoastal Waterway, St. Augustine, Fla. 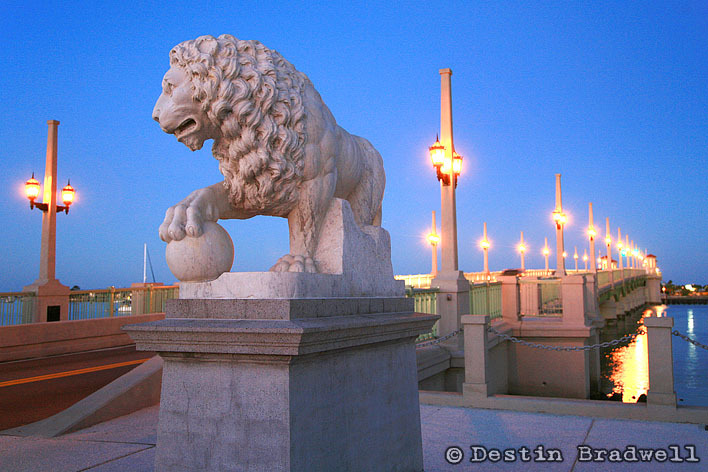 Built in the 1920s, the Bridge of Lions, with its distinctive pride of lions placed at the four corners of the bridge, occasionally causes administrative headaches for the Florida Inland Navigation District (FIND), the state sponsor for the federally controlled Atlantic Intracoastal Waterway in Florida. The narrow opening and the minimal height limits the size of vessels transiting the waterway, contrary to federal law mandating the minimum clearances of bridges spanning the Waterway. The Bridge of Lions has been designated a National Historic Landmark. Moreover, the bridge enjoys widespread support from the preservation community. Both factor make tearing down the Mediterranean Revival-styled bridge a difficult proposition. This entry was posted in Uncategorized on December 23, 2014 by Florida's Big Dig. On July 4, 2011, the City celebrated the 50th anniversary of the first wade-in by seven (7) African American residents wading in at the City’s segregated beaches. The celebration reenacted the the first wade-in. The wade-ins lasted for six (6) weeks. The City filed suit in the Broward County Courthouse to stop the wade-ins. A white, elected circuit court judge, Judge Ted Cabot, sided in favor of the NAACP and against the City of Fort Lauderdale. The judge’s state court decision resulted in the desegregation of the public beaches of Broward County, Florida. The author wrote an academic paper entitled, “The Long Hard Fight for Equal Rights,” published in Tequesta magazine by HistoryMiami in 2007, which formed the scholarly basis for the State of Florida consenting to the erection of a State Marker, remembering the wade-ins of the summer of 1961 as well as another State Marker memorializing the segregated “Colored Beach” at the north end of John U. Lloyd State Beach Recreation Area. This entry was posted in Uncategorized on December 21, 2014 by Florida's Big Dig. Palm Valley Bridge over the Intracoastal Waterway, near Ponte Vedra, Fla. Completed in 2002, the new Palm Valley Bridge, near Ponte Vedra Beach, is the only bridge across the Intracoastal Waterway in Florida not owned or controlled by the State. This fixed span bridge is owned by the Federal Government and maintained and operated by the U.S. Army Corps of Engineers. Its vertical clearance is 65 feet. All other bridges in Florida are state-controlled but generally built by matching funds provided by both the State of Florida and the Federal Government. Except for Palm Valley, the State of Florida provides for the funding of all bridge tenders. However, the U.S. Department of Homeland Security establishes the schedules for all bridge openings through the agency of the Coast Guard. Other rules regarding use of the waterway by vessels such as vessel speeds and anchoring (or mooring) in open water may be imposed by the state or local government or both to the extent the Federal Government decides to take no action. This entry was posted in Bridges and tagged fixed bridges, Palm Valley Bridge, Pente Vedra Beach, U.S. Army Corps of Engineers on December 20, 2014 by Florida's Big Dig.